There are Seven Wonders of the World. 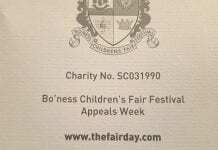 The eighth must be the wonder of the Bo’ness Fair. The Fair has a wondrous, magical quality that leaves it totally unequalled anywhere in the country. It is breathtaking in its splendour and unrivalled in its joy. And it is in this joy that I am happy to share. 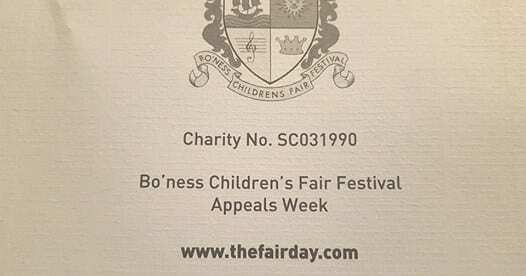 For I am sure that people born and bred in Bo’ness do not mind outsiders like myself sharing in the happiness that the Fair brings to the town. I had the misfortune of arriving to start work in Bo’ness the week after the 1980 Fair! Talk about bad timing! It was then I realised I was going to have to wait another 51 weeks to find out what this ” Fair ” that everyone talked about really was. As I walked around the town in those early weeks I found that everyone talked about the Fair. And everyone kept on talking about the Fair just gone by until, it seemed, the day arrived that it was time to start speculating on the Fair to come. I looked through the Journal and was dazzled by the hundreds of photographs of children dressed like characters out of a beautiful fairy tale book. I couldn’t wait for my first Fair. It seemed a very long time in coming round and by the time I had reported on the Fair Queen-Elect Karen Maxwell being chosen, Mrs Peggy Robertson, who was to crown the Queen, gathered in the lists of Fair presentees and characters and written the Bo’ness Fair Feature, I was probably just as excited as the school children whose biggest day of the year is the Bo’ness Fair. As Friday, June 26, drew close I began to get quite nervous. Everyone else seemed to know what to do on Fair Day. Everyone else seemed to know what to wear, where to be at the right time, and what was going to happen. On Fair E’en I drove round the town to find all the arches that were being talked about. Weeks, months even, of effort had gone into these works of art. I had never seen anything quite like it. Children ran around the streets giggling and talking excitedly of the day that was to come and what they were going to be doing. Bo’ness was transformed. The adults and children had thrown off the image of an industrial town and turned Bo’ness into a huge fairy palace with its very own Queen about to be crowned. I woke up very early that Fair morning determined that I was going to see everything that goes into making Fair Day magic. What was I going to wear? I hadn’t asked the ladies of the town what they were going to wear and I hurridly raked through the wardrobe to find something suitable. One of the first things I did was to run to the bedroom window and looked outside to see what the weather was like. One thing I had been told was the sun always shone on Fair Day. And true enough. The sky was blue – well, blue and white – and that seemed like a good omen. 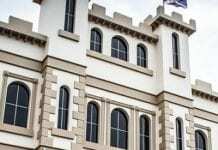 I rushed to the town hall to join the official and invited guests and then had the privilege of watching the Fair from the high balcony. It was as I stepped out onto the balcony I saw what the Fair really was. And I knew that it had been worth all those 51 weeks of waiting. Bands played triumphantly as they led each of the schools into the Glebe Park. There was a never ending stream of them and their magnificent tunes could surely be heard all the way across the Forth to Fife. The schools were finally in and so were the representatives of the town’s youth organisations. 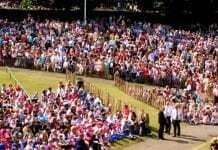 There was a blaze of colour and hardly a blade of green grass could be seen in the Glebe Park as almost 10,000 excited spectators crammed themselves in. They were standing on walls, sitting on shoulders, climbing the trees – and all to see Queen-Elect Karen Maxwell crowned. And then, in all their splendour, the Queen-Elect and her court arrived. It was a wonderful thing to see. Like something from a picture book they reached the platform – which was a sea of flowers, bowers, wands and dainty little fairies and flower girls. The outgoing Queen Annette arrived dressed exquisitely as ever and was that a tear in her eye as her glorious year as Bo’ness Fair Queen came to an end. As Mrs Robertson crowned Karen Queen you could almost have heard a feather drop in that crowded public park. Everyone craned their necks to see what the town had waited patiently a whole year to see. It was an incredible experience. Everything went like clockwork and it all happened as if by magic. The children, with the adult organisers and teachers discreetly in the background, did everything themselves. All too soon it was over and the young presentees dressed in costumes that could have been made for a Hollywood film set took to the stage giving their displays for their new Queen. Every school showed flair and imagination in their presentation and every mother, father, granny, uncle and aunt could be proud of their children that day. Soon everyone was put onto their appropriate float to be driven round the town waving and singing to the crowds that lined every spare inch of the streets of the town. Queen Karen and her court were regally transported in a horse-drawn carriage. Then came the Douglas Park for the “Revels.” This was really time for the children and they thoroughly enjoyed it all. But the adults joined in too and gave all the artistes a warm welcome. In the evening there were street parties while the children made the compulsory visits to the shows on the foreshore. There was nowhere in the town that was silent. Everywhere the excited chatter and babble of the day’s events. 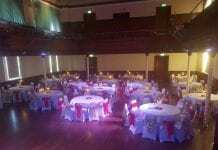 The reception at night in honour of the new Queen Karen was enjoyed by all who attended – even those with butterflies flitting around their stomachs at the thought of having to make a speech! And then, very tired but very happy, I toured the town again with a friend who had never been to Bo’ness before, showing off the arches and the bits of the Fair Day that were left. And I was proud to say that I had been there and watched Bo’ness Fair in all its glory.